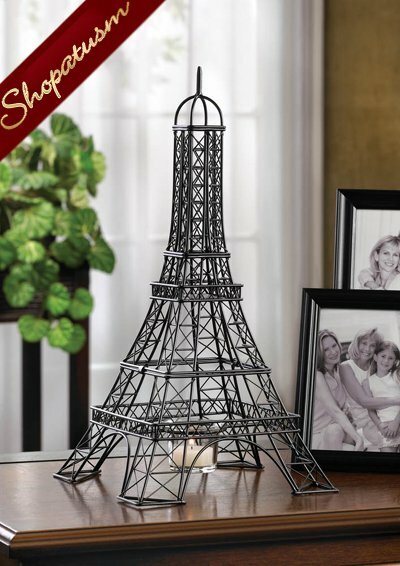 Beautiful Eiffel Tower centerpiece metalwork sculpture candle holder from Shopatusm. This beautiful candle holder gives your room Parisian style and gentle glow with its intricate metalwork inspired by one of the world's most recognized structures. This Eiffel Tower holds a glass candle cup in the base that's ready for the candle of your choice. Item weight: 1.2 lbs. 8 inch x 8 inch x 15 1/2 inch high. Metal and glass. Candle not included.